Kalotaszeg dowry display in the Museum of Ethnography in Budapest, Hungary. Írásos, "written" embroidery, a true expression of Kalotaszeg and Transylvanian culture and the pride of its people, adorns textiles for use in the home and for decoration. The first pieces date back to the 18th Century (as Katona Edit, a curator at the Ethnographic Museum in Budapest told me). Wall hangings were produced to commemorate ceremonies and as gifts for the church. Girls would sew their dowries, comprising pillows, sheets, and bedspreads, as well as elaborately decorated dresses that included ribbons and beadwork. Tulips, flowers, stems, leaves, lines, and circles form patterns often nearly covering portions of the fabric, inspired by Renaissance or Turkish motifs. Patterns are first drawn or "written." Frequently women work together, some specializing in drawing and others in stitching. The stitching is done in all one color—red, blue, black, or white—on white or natural linen or hemp using a small or large, square chain or open braid stitch. No hoop or support structure is used while stitching. Using heavier fabric with a tight weave is very important, as I learned when asking women to embroider test samples. Today, fewer and fewer young women are learning the technique nor are they doing much handwork of any kind. Other styles of embroidery, like cross-stitch and vagdalásos, a pattern with eyelets, are more commonly practiced by elders in the community as they are less labor-intensive. ThreadWritten hopes to be able to fund training for a group of women in Kalotadamos who are interested in relearning the technique. While traveling in 2012, I was surprised at how difficult it was to find írásos. The Hungarian Reformed Calvinist Churches display large, beautiful wall-hangings and many of the Bibles and hymnals have embroidered covers. Apart from churches and museums, the work is hardly visible and rarely offered for sale. Several people told me that even traditional textiles are now being made in China for sale to tourists in Transylvania. I was lucky enough to meet and stay with Kudor Maria in Banffyhunyad who showed me her personal collection of textiles and costumes, including pieces she has stitched herself and work she has organized for an exhibition in Germany. 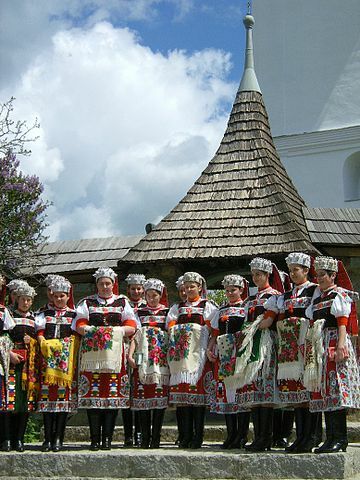 The folk arts and traditions of the region have been well documented by Hungarian ethnographers, artists, and writers. In the early 20th Century, Hungarian architect, writer, illustrator, ethnologist Károly Kós documented the culture with a book of wood block prints and text that is well-known in Hungary. Composer Béla Bártok collected music and textiles from the region. The Smithsonian Folk Life Festival in Washington, DC this year highlighted Hungarian culture; one of four presentations focused on Kalotaszeg culture. Map of the area showing ethnic populations, 1992. Red: Hungarians, Lavender: Romanians. Author, Sebök László, Publisher,Teleki László Foundation, Budapest. In blue, I have circled the Kalotaszeg region on the left and Târgu Mureș/ Marosvásárhely, where I am working. Izvoru Crișului/ Körösfö. Photo by Petru Suciu. Transylvania is located in Central-Western Romania in Eastern Europe. Famous for the setting of Bram Stoker's Dracula, it was part of Hungary until the end of World War I, when the Austro-Hungarian Empire dissolved and the Romanian majority proclaimed union with Romania. In 1920, the Treaty of Trianon established a new Romanian-Hungarian border, with a large Hungarian minority in Romanian territory. Ethnic Hungarians now make up 6.5% of the population of Romania. Most live in Transylvania, where they comprise 18% of the population ("Comunicat de presă privind rezultatele provizorii ale Recensământului Populaţiei şi Locuinţelor – 2011"). After identifying the Romanian names, I have chosen to refer to cities in Hungarian, as that is the mother tongue of the artisans with whom I'm working. The Calata (RO)/Kalotaszeg (HU) region is located in Western Transylvania, in Central Romania, west of Cluj/ Kolozsvár. Two rivers and two small mountain ranges delineate the area containing 20 villages with Huedin/Banffyhunyad, a town of about 9,000 people, at its center. 32% of the population of Banffyhunyad is Hungarian, 58% is Romanian, and the remaining 9% is Roma (Centrul de Resurse Pentru Diversitate Etnoculturala). The Reformed Calvinist Church in Banffyhunyad was built in the 13th Century. I am working with women in Banffyhunyad, and the nearby villages of Kalotadamos, population about 200, and Kispetri, population about 85. In March through October the majority of people tend hay in the fields or large gardens to grow food for the winter. Making clothing and handcrafts are relegated to the winter months. Fortunately, a few of the women were able to devote time to ThreadWritten's first production run this spring. Many young people leave rural areas to attend university or are forced to go elsewhere to find jobs. While proud of their accomplishments, a friend lamented that her three daughters, in their late 20s and early 30s, all live abroad—in Budapest, Prague, and London. I met a family whose 18-year-old son had just left to work in Italy for two months, expecting to earn what he would in Romania in six months. I am also working with Hungarian Unitarian women in Marosvásárhely, population approximately 128,000 ["2011 census" (in Romanian)]. The Unitarian Church began in Transylvania and in Poland at the same time in the mid- 1500s. (Hillerbrand, H. J., The Encyclopedia of Protestantism 137, 2004). There are two Unitarian churches in Vásárhely today. In the modern church, built over the last 10 years, írásos tablecloths and hangings decorate the sanctuary and the Bibles all have embroidered covers. As people lead a contemporary, urban lifestyle, the women are able to sew year-round. In retirement, people receive pensions of $90 to $120 if they worked on a collective farm during Communism, or $240 or more, if they were a doctor or a teacher in town (Sara relayed to me from Pastor Csilla). The cost of food has risen to rival U.S. prices. Banffyhunyad has a Penny Market, a large, German-owned, chain, "discount" grocery store. I was surprised to pay basically the same prices there as I would at home in California. While more reasonable, the prices at the weekly outdoor market and small shops have also risen. The cost of water, wood, gas, and electricity continues to increase. Purchasing a ThreadWritten product helps financially support retired women and their families. Sign up for the mailing list to be the first to hear about new workshops and events! Follow on Instagram for inspiration, travel photos, upcoming classes.